Dupont Street is one of those chameleon city stretches that seems to morph at about every three blocks. There are some characteristics that might stand out to the occasional visitor — the seeming abundance of storage spaces, the one gas station that's always a cent or two cheaper than the rest, the surplus of brown buildings — but there actually is quite a vibrancy that might be missed by a quick commute. While the west end of Dupont has its churrasqueiras, the odd cafe, and plenty of sports bars, the eastern end is ever-expanding with brunch options, diner restaurants, and specialty shops. 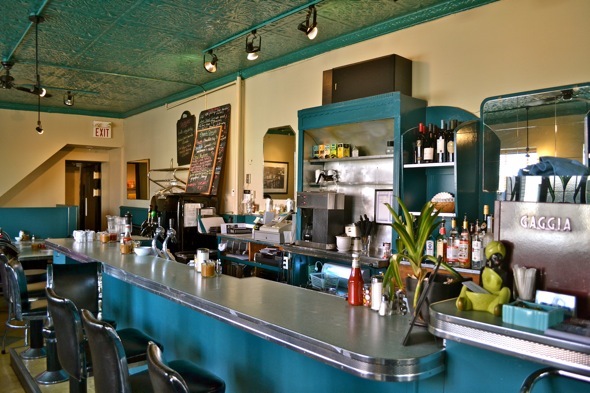 Here are some places to check out on Dupont Street. One of the newest spots for espresso on Dupont and easily one of the favourites. Opened by the couple behind CocoLatte on St. Clair, this cafe is less lunch and crepes and more coffee and snacks, with ample room for WiFi surfing and cafe con leche (naturally) to go alongside. A friendly spot with a real "neighbour" feel. In the former home of the beloved People's Foods, Rose and Sons is trying to ease the neighbourhood's wounds with matzo ball soup, club sandwiches, and chicken souvlaki for a little taste of the past. This spot is a little more refined than the former restaurant occupying the space, but it does offer old comforts in the form of classic bread pudding and bagel and lox. Part yerba mate cafe, part general store. Like the El Almacen on Queen, this spot offers deliciousness in the form of empanadas, homemade alfajores, espresso, and yerba mate, but they come alongside racks of printed tees and leather boots, as well as vintage furniture and memorabilia. This spot is more grab-and-go than sit and sip, but at least you can buy and take the bar stools home with you. It's not particularly trendy or pretty, but Leiria Bakery certainly serves its purpose if you're looking for homestyle, nostalgic baked goods. Front and centre are Leiria's Portuguese custard tarts, but the bake shop also makes fresh breads, croissants, pastries, and sandwiches. Prices, especially on day-old items, are quite good here as well. Because what stretch of urban road would be complete without a place to pick up a Japanese cleaver? 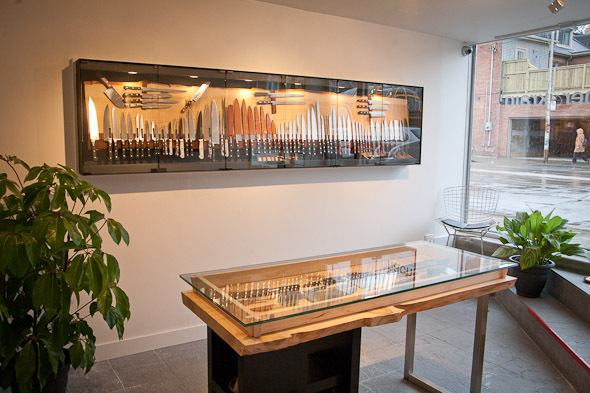 Hacher and Krain offers over 200 different knives in its tiny lower-level shop, with a special focus on Japanese, German, and French knives. Not for clumsy or accident-prone patrons. A very casual spot for Portuguese chicken in the Junction Triangle. The restaurant itself doesn't really wow on first impression, but the chicken (which is, of course, the most important part) certainly does. Best to opt for take-out here, but since Churrasqueira Arcuense is open late every day of the week, hours will definitely accommodate evening cravings. Yes, it's in a tired-looking strip mall, but Thai Lime really shouldn't be overlooked. Never mind the sleek and modern-looking interior design, Thai Lime offers some pretty tasty pad thai, spring rolls, and various types of curry, plus huge portions and incredible quick service. Score one for the strip mall. Some love it and some, well, probably wouldn't be so kind. Granted, this churrasquiera isn't exactly upscale gourmet, but if you're looking for cheap, filling, and indulgent BBQ chicken (and aren't on any diet whatsoever), Eduarda's will surely suffice. And no one will look twice if you show up wearing sweatpants. Just so long as you don't mind a giant moose head staring at you while you eat, Farmhouse Tavern is a choice spot on Dupont for a smoked oyster Caesar and fried duck egg brunch. This place goes beyond the standard bacon and eggs offerings with selections such as mushroom frittatas, smoked chicken crepes, and duck prosciutto. 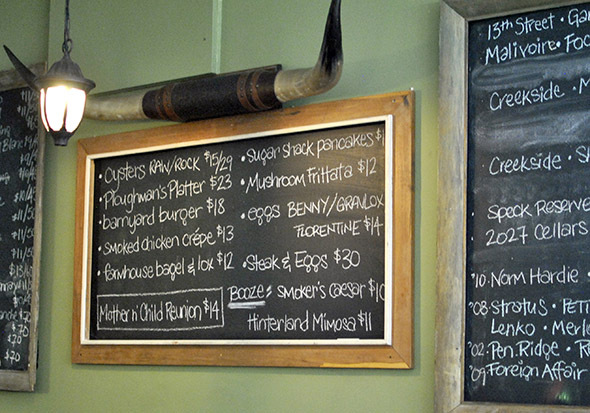 And while the menu does change from day to day, the moose stare remains a stagnant feature. For when you need a little pang of literary nostalgia. Or a beer — most likely a beer. Boo Radley's has a bit of that local watering hole-type feel, with great service, classic pub food, and a bartender that will probably remember your name the next time you visit. Wings and the Sunday roast are particular neighbourhood draws. Neapolitan pizza for the Dovercourt village crowd. A much-anticipated area arrival in 2012, Picea 997 helps to ease the community's yearning for a classic, delicious margherita. Receptive to text-message ordering and complete customization, this pizzeria and bar also does a well-reputed pork ragu and classic lasagna. This is Portuguese chicken with seating, table service, and 10z steaks sharing the menu. Piri Piri is a little pricer than some of the other Portuguese spots on Dupont, but it comes with a much more varied menu that includes options such as shrimp soup, grilled octopus, and cod. The piri piri sauce, naturally, is a customer favourite. You need some place to work off all of that barbecue chicken and custard tarts, right? 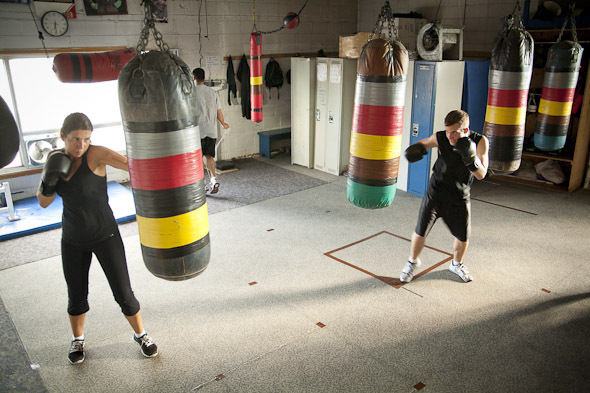 Sully's Boxing Gym is a famous name worldwide, with notable alumni that include Muhammad Ali, George Chuvalo, and Fern Bull. Former Canadian Heavyweight Champion Tony Morrison helps to work would-be athletes (or just people who want to up their fitness) into shape, with plenty of programs for various ages and skill levels. As you move further east along Dupont, you'll find this Canadian-centric design shop that's plush with colour and hand-blown glassware. Tahir Mahmood is a big name at Pimlico, along with Jennifer Grahams' ceramics and Timid glass and accessories. Peaks and Rafters is a furniture shop for big and small, tackling huge interior design renovations as well as small refurbished or salvage projects. Peaks and Rafters will tackle any room in the house (or cottage) with a sister location out in in Port Carling. Yes, there really is a Vinny, but these paninis are based on his mom's recipes. While you might have to wait around for a bit for your sandwich to be prepared fresh to order, the veal cutlet panini and meatball sandwich are definitely worth a few extra minutes standing idle by the counter. Those who know call ahead to pick up their order about 20 minutes later. Right at the corner of Shaw and Dupont, Universal Grill arguably makes one of the best plates of Huevos Rancheros in the city. This is a place with a no-fuss, diner-type approach to weekend brunch, with a menu of classic egg n' bacon options, and drip coffee that always outdoes its fancier espresso-based counterparts. A pilates studio, a health clinic, and a training facility all in one. Voted among the best pilates studios in Toronto, Body Harmonics offers dozens of classes each week with everything from bootcamps to body sculpting, mat classes and post natal pilates. The Dupont studio also hosts welcome packages and one-on-one sessions throughout the week. Like Vinny at the panini shop, there really is a Marlene. And this Marlene knows a thing or two about babies and their gear. This shop stocks everything from strollers to car seats, toys, clothes, and more, with regular safety seminars hosted by Marlene Krybus herself. The staff here is usually incredibly friendly and knowledgeable, and prices are about on par with other baby shops in Toronto. With a fantastic, expansive patio in the summertime and great cappuccinos throughout the year, Faema is an easy choice for a coffee on the eastern end of Dupont Street. The cafe caters to the lunch crowd with freshly made soups, pizzas, and sandwiches, but with a name like "Faema" Cafe, the espresso drinks are certainly the main attractions. Lots of room, too, to spread out and sip. This petite little chocolate shop has a remarkable ability to distract drivers and sidewalk pedestrians; blame it on those delicious-looking truffles and gift baskets in the window. This family-run shop offers handmade truffles, chocolates, pastries, tortes and more, with various classes and workshops available for those who want to try their hands at the chocolate-making process. Most just stick with eating, however.